The Urban Heat Island (UHI) is a well-studied phenomenon, whereby urban areas are generally warmer than surrounding suburban and rural areas. The most direct effect on health from the UHI is due to heat risk, which is exacerbated in urban areas, particularly during heat waves. However, there may be health benefits from warming during colder months. 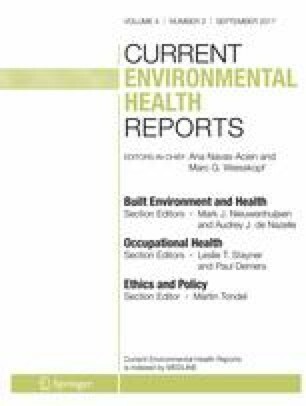 This review highlights recent attempts to quantitatively estimate the health impacts of the UHI and estimations of the health benefits of UHI mitigation measures. Climate change, increasing urbanisation and an ageing population in much of the world, is likely to increase the risks to health from the UHI, particularly from heat exposure. Studies have shown increased health risks in urban populations compared with rural or suburban populations in hot weather and a disproportionate impact on more vulnerable social groups. Estimations of the impacts of various mitigation techniques suggest that a range of measures could reduce health impacts from heat and bring other benefits to health and wellbeing. The impact of the UHI on heat-related health is significant, although often overlooked, particularly when considering future impacts associated with climate change. Multiple factors should be considered when designing mitigation measures in urban environments in order to maximise health benefits and avoid unintended negative effects. The research was partly funded by the National Institute for Health Research Health Protection Research Unit (NIHR HPRU) in Environmental Change and Health at the London School of Hygiene and Tropical Medicine in partnership with Public Health England (PHE) and in collaboration with the University of Exeter, University College London and the Met Office. The views expressed are those of the author(s) and not necessarily those of the NHS, the NIHR, the Department of Health or Public Health England. Clare Heaviside, Helen Macintyre and Sotiris Vardoulakis declare that they have no conflict of interest. Public Health England. Heatwave plan for England. 2015. Available at https://www.gov.uk/government/publications/heatwave-plan-for-england.